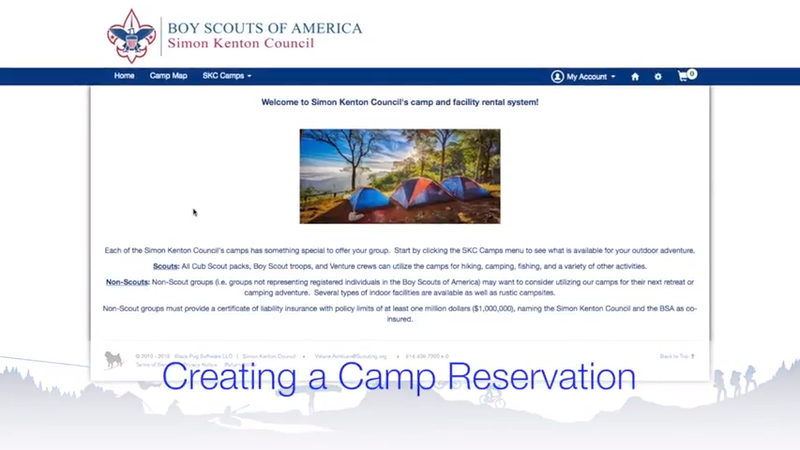 How to add an access code to your reservation. This meeting room is the upper portion of the Gordon Hall addition directly above the Bat Cave. It has enough tables and chairs to seat 25. There is no sleeping or cooking allowed in this building. The water source and latrines are within a few minutes walk. Parking is 200 yards away. 1. 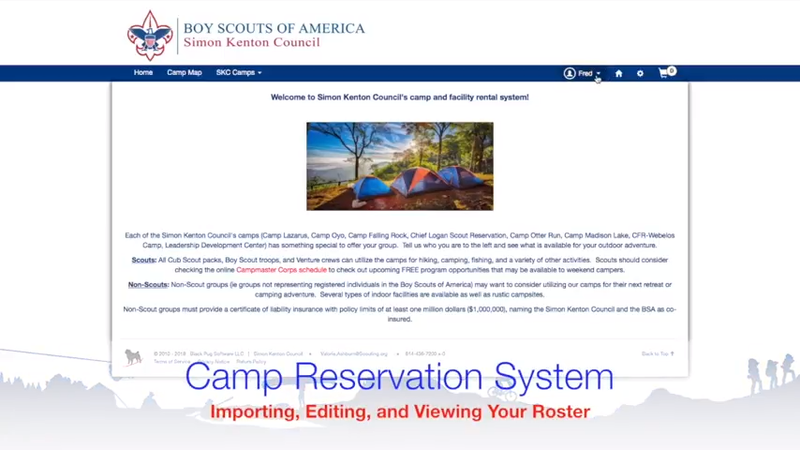 Reservations are accepted up to one (1) year in advance at either Scout Service Center. District reservations and council events may be made 18 months in advance. 2. Reservations are confirmed only upon receipt of this completed form and full payment of the building fee, site deposit, and/or canoe rental. Program and equipment requests will be honored on a first-come, first-serve basis. 3. Districts will be billed 90 days in advance for reserved facilities. (Districts must cancel at least 90 days in advance to be able to transfer building/site fees paid toward another date within one (1) year. 4. Fee payments for campers, equipment rentals, shooting sports, and trading post charges must be paid at time of check-out before group departs from camp. (Advance payment is required for canoe rentals.) If no group payment is available, adult leaders are responsible to make a personal payment to be credited from the group. 1. Units must have at least two (2) adult leaders at all times. The adult leader in charge must be at least 21 years old. Coed Venturing crews must have both male and female leadership. At least one participating adult must be certified in â€œYouth Protection Trainingâ€ for all scouting activities. Youth are not to be without adult supervision while roaming camp grounds. You are responsible for your Scouts and their actions. The buddy system should always be used at camp. Adult Leader Outdoor Orientationâ€ (BALOO)for any Cub Scout Overnight Campout. supervision. Liquid fuels are not recommended. Chemical fuels and open flames are prohibited inside tents. Chemicals fuels are not allowed to be used to start fires. 3. Fires are to be built only in designated rings or barrels. The camp ranger may prohibit fires during extremely dry conditions. Fires are not to be left unattended. Put fires out cold. 4. Standing timber or brush is not to be cut without approval of a camp ranger. 5. Recyclable items and garbage should be separated and placed in appropriate containers in designated area. Please recycle to conserve our natural resources. 7. Do not disturb the campsite; no digging, trenching or raking. 8. Snowmobiles and ATVâ€™s are not allowed in camp. any kind may be brought to camp. 10. Use camp toilets and latrines properly. Do not dispose of garbage, wash water, aluminum cans, etc. in the facilities. 11. Pets are not allowed in camp. 12. Alcoholic beverages and illegal drugs are not allowed in camp. 13. The camps will be closed in the event conditions make it impossible to access building/sites. Groups will be called in the event the camp ha been closed by the council. If the council closes the camp or in the event the weather conditions close schools and/or public events, groups may transfer building/site fees paid toward another date within one (1) year. Where swimming or boating are included in the program, Safe Swim Defense, No. 34369, and/or Safety Afloat, No. 34368, standards must be followed. For all aquatic activity, one adult must be CPR Certified. Proof of certification is required on the day of arrival. 15. Shooting Activity: Where archery is included in the program a NSC Archery Range Master, USA Archery or National Field Archery Association instructor must be present. Where BB guns are included in the program a NSC BB Gun Range Master or National Rifle Association instructor must be present. These certifications can be obtained by attending any number of council sponsored shooting sports training days. 16. Climbing Activity:Where a climbing tower is included in the program one (1) adult leader must have attended a Tower Operations class, and hold a Climb On Safely Certification. Â· Absolutely no passengers in the beds of trucks or trailers are allowed at any time. with coverage carried by the owner of the rented vehicle. Â· You will enforce reasonable travel speed in accordance with state and local laws in all vehicles. One adult leader must present a roster and check-in with the Camp Ranger, or Campmaster upon arrival to review your group plans,facilities, rules of the camp, and any special accommodations. Check-in time after 5PM on Friday night. Please confirm your Friday evening or Saturday morning arrival time with the camp ranger prior to your camping dates should it be different than originally stated on the Camp Facility Permit Application. Check-out is by NOON on Sunday. Groups are not to leave camp until the site and/or building has been inspected by the camp ranger or Campmaster to insure cleanliness and check for damages. At this time, any group wishing to continue their own program may stay in camp until 3PM. This must be pre-approved by the Camp Ranger or Campmaster. Cancellations made more than 45 days in advance a group can transfer building/site fees paid toward another date within one (1) year. Cancellations made less than 45 days in advance will result in loss of building/site fees paid.